Alouette Lake is a popular spot for swimming, windsurfing, water-skiing, canoeing, boating and fishing. The park also has three large campgrounds. Vegetation is typical of the coastal western Hemlock forest of B.C. and the mountainous backcountry is extremely rugged. Park hosts and a security patrol are available during the summer months. During the summer, Golden Ears Provincial Park is extremely popular, especially on weekends. Visitors are advised that the park is subject to periodic closure to day-users and/or boaters when the day-use and/or boat launch parking lots fill to capacity. Closures generally occur on sunny weekends and holidays during July and August, and usually occur between 11am and 4pm. Cell phone service is poor or not available in many areas of the park, including the campgrounds and Alouette (South Beach) day-use area. Hikers entering the backcountry should ensure a responsible person is aware of their trip plans including destination, equipment carried, and planned return time. There is an emergency shelter on Panorama Ridge on the Golden Ears Trail, available for emergency use situations only; no overnight use. Campsite reservations are accepted and first-come, first-served campsites are also available. Group campsite reservations are accepted at this park (minimum 15 adults) year-round. Picnic/day-use area is available on a first-come, first-served basis only and is not reservable at this park. Golden Ears Provincial Park lies in the Coast Mountains 11 km north of Maple Ridge on the north side of the Fraser River. Access to the park is by vehicle via Dewdney Trunk Road through the Municipality of Maple Ridge. If heading west, turn right onto 232nd and if heading east, turn left onto 232nd; then turn right onto Fern Crescent at the traffic circle and follow the road into the park. The campgrounds are approximately 11 km north of the park entrance. The closest communities, towns and cities are Maple Ridge, Mission and Pitt Meadows. Did you know Parkbus is an environmentally friendly, affordable transportation service from downtown Vancouver to select BC Parks? To find out more about Parkbus, as well as their routes and schedules, check www.parkbus.ca or contact them at 1-800-928-7101. Please note: Due to campground expansion in Gold Creek, some of the facilities shown on the campground maps will be relocated. History: The park was named after the twin peaks of Mount Blanshard near the peak’s western boundary. Originally part of Garibaldi Provincial Park, the establishment of Golden Ears Park in 1927 recognized the almost impenetrable mountain barrier between the two areas. Cultural Heritage: Human activity in Golden Ears, both past and present, has been confined to the accessible Alouette Valley in the south of the park. In the 1920s, the forested slopes of the valley became the site of BC’s greatest railroad logging operation until a disastrous fire swept through the valley in 1931. The lake and its forested surroundings were also the traditional hunting and fishing grounds for the Douglas-Lillooet (Interior Salish) and Katzie (Coast Salish) First Nations peoples. Conservation: The park represents the Coastal Western Hemlock biogeoclimatic zone and is characterized by a second-growth forest of western hemlock, western red cedar and Douglas fir. There are a series of sphagnum bogs at the south end of Alouette Lake. Wildlife: The park’s lush plant growth, numerous waterways, and mountainous terrain provide habitat to a variety of animals including beaver, deer, black bear, and mountain goat. Canoeing is very popular on Alouette Lake. Canoe/kayak/pedal boat rentals are available for rent in the Alouette (South Beach) day-use area on weekends only from May long weekend to late June and daily from late June to Labour Day (weather permitting). Please call the Park Operator at 604-466-8325 for more information about canoe rentals. The park also offers boat accessible camping along the Lake; see the rustic marine campsites information. There are no recommended technical climbing opportunities in Golden Ears Park. There are two mountains	accessible by official trails that require intermediate skills to reach the peaks. Both are long strenuous hikes requiring proper equipment and experience. Alouette Mountain is accessed on 11 kilometres of trail from Mike Lake using the Incline and Alouette Mountain Fire Access Trails. A return trip will take 9 or 10 hours. Be sure to take water and expect snow well into June. The Golden Ears are accessed from the West Canyon parking lot via the West Canyon/Golden Ears Trail. This 12 kilometre trail has an elevation change of 1500 metres. Suggested one way time is 7 hours. The round trip is an overnight expedition for all but the fittest. There are camping sites at Alder Flats and Panorama Ridge, see the wilderness/walk-in camping information. Ascent of the North Ear is made from the left (east) side across a permanent snowfield. Extreme caution is advised and proper equipment is recommended. Water may be scarce beyond Alder Flats. Expect snow on Panorama Ridge well into July. Cycling is permitted. Please keep to roadways and marked trails. Check the park map for bike specific trails. [PDF] There are over 20 kilometres of biking trails in the park. Bicycle helmets are mandatory in British Columbia. Anyone fishing or angling in British Columbia must have an appropriate licence. No powerboats or other motorized craft are permitted on Mike Lake. Golden Ears Provincial Park provides a variety of opportunities for walking and hiking amongst a setting of lakes, streams, mountain peaks and valleys. For your own safety and the preservation of the park, please keep to designated trails and obey posted signs. There is an extensive network of over 20 kilometres of gravel/dirt horse trails in the park. Check the park map for horse-specific trails [PDF]. Horses are not permitted on trails other than those designated on the park map. A permit is only required for commercial use of the horse trails. No camping with horses is allowed in park frontcountry (parking lots, day-use areas, or any area less than 1km from a park road), or in the vehicle accessible campgrounds. Day-use stopover is permitted at the South Beach corral area, but horses must remain within the corral or on a designated horse trail. Please note: It is hazardous for horses to go past Viewpoint Beach on the East Canyon Trail. The floodplain area of Gold Creek has mudholes. Horses are not permitted on the East/West Canyon Connector Trail and the Gold Creek Bridge. Dogs must be on a leash, no longer than 2 metres long, and under control at all times, including in campsites, campgrounds and on trails within 1km of the Parkway Road. Pets/domestic animals are not allowed in the picnic areas, beaches, marked off swimming areas or park buildings. Dogs are strictly prohibited at the main Alouette (South Beach) day-use area, which is accessible from parking lot #2, and from Campers Beach, between Gold Creek and Alouette campgrounds. Dogs are permitted (on leash) in only two beach areas: at the North Beach day-use area near the outflow area of Gold Creek into Alouette Lake and at the Alouette (South Beach) day-use area between the boat launch and the canoe rental shop, which is accessible from parking lot #1. Trails beyond 1km of the parkway road are considered backcountry and dogs may be off a leash but must be under control at all times. However, backcountry areas are not suitable for dogs or other pets due to rugged terrain, wildlife issues and the potential for problems with bears. There is swimming available at all campgrounds and day-use areas. Marked swimming areas are available from June 17 to September 5 at the Alouette (South Beach) day-use area and Campers’ Beach between Gold Creek and Alouette Campgrounds. Swimmers outside marked swimming areas should exercise extreme caution due to power boats operating on the lake. Please note it is a criminal offense to tamper with or damage life-saving equipment at the rescue stations. Please note that there are no lifeguards on duty at provincial parks. There are waterskiing opportunities on Alouette Lake. There are windsurfing opportunities on Alouette Lake. There is one four-lane cement surface boat launch at the south end of Alouette Lake. There is overnight parking available for vehicles and trailers in the boat launch parking lot. There is no nearby marina to moor boats overnight. Waterskiing is permitted. It is not recommended to leave your boat overnight in the water due to theft. The park also offers boat accessible camping along the lake; see the rustic marine campsites information. During months outside the summer season, the water level in Alouette Lake may vary considerably due to water management by BC Hydro. Boaters should be especially wary during low-water conditions, as submerged stumps and other obstacles may be hazardous to navigation. Campfires are not permitted in the backcountry and marine sites of Golden Ears Park. Use a portable fuel stove for cooking! Campfires are only permitted in metal fire rings provided at the Alouette Campground, Gold Creek Campground and North Beach Campground. Firewood can be purchased in the park from the park operator or you may bring your own wood. Limited burning hours or campfire bans may be implemented. To preserve vegetation and ground cover, please do not gather firewood from the area around your campsite or elsewhere in the park (this is a ticketable offence under the Park Act). Dead wood is an important habitat element for many plants and animals and it adds organic matter to the soil. Cold water taps are located throughout the park. Drinking water from taps is tested on a regular basis. Water taps are shut off in the winter season. For water testing information, please contact the Park Operator at 604 466-8325. All backcountry drinking water should be filtered, boiled and/or otherwise treated before consumption. Wash all dishes and conduct personal hygiene at least 30 metres from any water source. Please Note: There is no permanent source of water past Alder Flats. Depending on the season, water can be melted from the snowfield that may remain in the northern shadow of the peak. There are two group campgrounds available for reservation, by any group booking a minimum of 15 adults, with a maximum total of 50 persons. A minimum booking fee applies and additional fees apply for extra persons. There is a covered shelter available at the Golden Ears group site by West Canyon parking lot. The Alouette group site is located near the boat launch by the lake. Group campgrounds may be booked up to one year in advance. Keys issued for both the Golden Ears and Alouette group campgrounds will not allow access to the main park gate on Fern Crescent. Please plan to have your entire camping party enter the park prior to the daily park closure time. Regular group camping charges per night are the base rate for the site, which is $120.00/group site/night, plus $5/adult (16+, minimum charge for 15 adults), plus $1/child (6-15). Children under 6 are free! There are four day-use beach areas on the shoreline of Alouette Lake in Golden	Ears Park. Alouette (South Beach) Day-use Area: Vehicle accessible area located at kilometre 7 along the main parkway. There is a sand/gravel beach with seasonal roped off swimming area, no lifeguards are on duty; canoe/kayak/pedal boat rentals are available (see “Canoeing” above). There are barbeque attachments available on some picnic tables. Bring briquettes and barbeques, fires are not permitted. Dogs are not permitted in the main part of this day-use area. There is a beach area for leashed dogs between the boat launch and the canoe rental shop. Open for summer season with full services – flush toilets, drinking water taps, changehouse. Open for winter season with minimal services – pit toilets only. Campers Beach Day-use Area: Campers Beach is a walk-in area adjacent to Alouette and Gold Creek campgrounds. Day-use visitors can park in visitors’ parking lot beside the ticket booth. Campers Beach has a sand/gravel beach with a seasonal roped off swimming area, no lifeguards are on duty. Dogs are not permitted. A water tap is available April 1 to Thanksgiving. Only pit toilets are available. North Beach Day-use Area: North Beach day-use area is adjacent to the North Beach campground, accessible on foot from the East Canyon parking lot via the North Beach Trail. The beach is sand/gravel, no lifeguards are on duty. There are only pit toilets available. Dogs are permitted on this beach, but must remain on leash. Alouette (East Beach) Day-use Area: The East Beach day-use area is directly across from South Beach and only accessible by boat. Pit toilets are provided and are located a short distance up from the beach at both the north and south end. Pit and flush toilets are located at Alouette and Gold Creek campgrounds and the day-use area of the park. There are only pit toilets at North Beach campground. During winter season all flush toilet facilities are closed, pit toilets only. Pit toilets are located at all designated backcountry camping areas and marine campsites. Supply your own toilet paper. At no time should garbage ever be placed in the toilet facilities! There is a playground near the washroom/shower building in the north end of Alouette campground. A sani-station/dump is available during the summer season. The sani-station/dump is located off the main parkway just before the campgrounds. The sani-station is closed from Thanksgiving Monday to March 31. Sani-station Use Fee: $5.00 per discharge, payment by $1 and $2 coins only. There are hot showers at no extra cost in buildings located in the Alouette and Gold Creek campgrounds. There are no showers at North Beach campground and group campgrounds. During the winter season, all shower buildings are closed. There are three vehicle accessible campgrounds in this park – Gold Creek, Alouette and North Beach. The campgrounds are for the use of registered campers only; picnicking facilities are available at the Alouette (South Beach) day-use area. 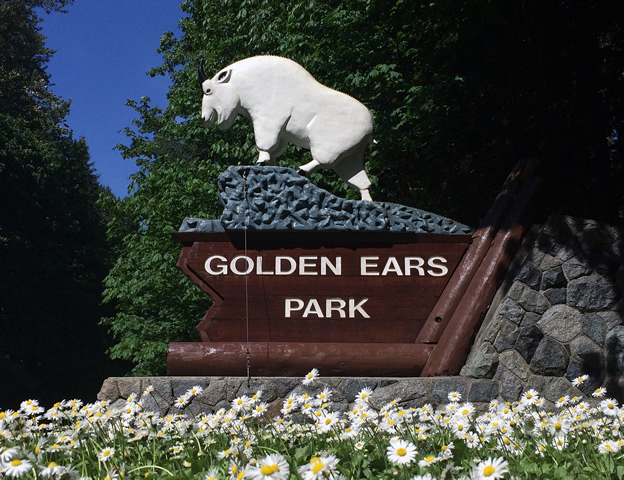 Golden Ears campgrounds are extremely popular, and fill most weekends during the summer. Overnight stays are limited to 14 nights per calendar year per person. You can find photographs and descriptions of all the campsites at Discover Camping. Maximum two vehicles per campsite (both must register); there is no parking for extra vehicles within the campgrounds. Visitors parking lots are available for day parking at all campgrounds. Campsite reservations are accepted and first-come, first-served sites are also available. Camping fees are payable in cash only at the park. Campers must have a designated sleeping accommodation (RV, camper, tent trailer, RV trailer) on site in order to register. Summer season (mid-June to Labour Day) – all campers check in at the ticket booth. campers with reservations: check the reservation board at the ticket booth for your last name/site number, and proceed directly to your reserved campsite. Staff will come by to complete your registration. campers without reservations: locate an unoccupied campsite that does NOT have a “Reserved” sign, staff will come by to complete your registration. If you cannot locate a vacant campsite, check the reservation board at the ticket booth for reserved campsites that may be available on a one or two-night basis, or check with staff in the park. Gold Creek campground is open year-round (road conditions permitting). Alouette and North Beach campgrounds are gated and locked during the shoulder season unless required as overflow (see “Campground Dates of Operation” above). Golden Ears Store and Concession is open late June to Labour Day, otherwise the closest store is in Maple Ridge approximately 14 kilometres away. Cell phone reception is poor or not available at most locations in Golden Ears Park, and there is no pay phone in or near the park. BC Senior’s Rate (day after Labour Day to June 14 only): $17.50 per senior party/night. Read the User Fees Policy for information on Senior Camping Discounts. BC Senior’s Rate (day after Labour Day to June 14 only): $11.50 per senior party/night. Read the User Fees Policy for information on Senior Camping Discounts. Backcountry Camping is permitted at designated wilderness sites only. Rustic camping sites are located at Alder Flats on the West Canyon Trail at 5.7 km, Viewpoint Beach at 4.5 km and Half Moon Beach at 9.8 km on the East Canyon Trail as well as on Panorama Ridge near the Emergency Shelter on the Golden Ears Trail at 10.7 km. Pit toilets are available at Alder Flats Viewpoint Beach and Half Moon Beach. A seasonal porta potty is provided on Panorama Ridge during high volume use in the summer. A backcountry camping permit, obtained through the Discover Camping website link below, is required for your overnight stay in the backcountry of Golden Ears Park. Proof of payment must be carried at all times while in the park. Rustic marine campsites are located on the west shore of Alouette Lake at Moyer Creek, The Narrows and Alouette River (north end of the lake) as well as on the east shore of Pitt Lake, at Raven Creek, Osprey Creek South and Osprey Creek North. All of these marine campsites are only accessible by boat and pit toilets are available at each camping area. There are no mooring facilities. Please Note: Campfires are not permitted in the backcountry in Golden Ears Park. Campfires are permitted below the high-water mark at marine sites on Alouette and Pitt Lake. Backcountry and marine campsites are user-maintained and there is no garbage removal service in any of the backcountry or marine campsites. Please take along a garbage bag and carry out all trash that you generate. There are wheelchair accessible toilets at all campgrounds and in the Alouette (South Beach) day-use area. There are wheelchair accessible showers in Gold Creek and Alouette campgrounds. Four campsites at the Gold Creek campground are paved. The Spirea Universal Access Trail is wheelchair accessible. Wheelchair access is also available to the beach from parking lot #2 at the Alouette (South Beach) day-use area. Winter camping is available in Gold Creek campground (unless park road is closed due to hazardous conditions). Alouette and North Beach campgrounds are closed in winter season. During the winter season, Golden Ears Park main gate is locked from 5:30 p.m. to 8:00 a.m. daily. A call-out number is posted on the main gate to contact staff for emergencies only during closed hours. Campers exiting the park on an emergency basis during closed hours cannot re-enter the park until after 8:00 a.m. the following morning. An attendant will collect the fee and complete registration on site. Payment is accepted in cash only.